My kids love that song. And I must admit it is rather catchy. Luckily it was stuck in my head as I was wondering what to do with my toddler this afternoon. Muffins! We will bake muffins! After trolling online through seemingly endless muffin recipes I finally found one that satisfied my holy trinity of baking recipes: healthy, easy, and delicious! It seemed too good to be true. 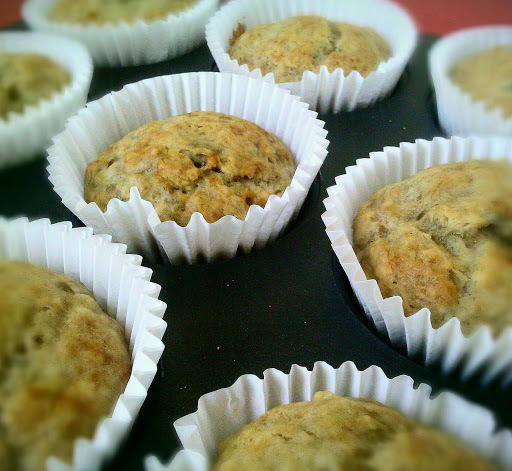 But these banana muffins from Cat Can Cook looked amazing! So, measuring cups in hand, we hoped to make our muffin magic. With over 1000 positive comments on her site for this recipe, Cat was right. Not only were these moist and delicious but they were so easy that my 3 year old practically made them by himself. What a fun and yummy afternoon of mommy-son bonding. Mix the mashed banana, sugar, egg and margarine together. Set aside. In a separate bowl, mix together baking soda, baking powder, salt and flour. Mix wet and dry ingredients all together. Pour into greased muffin tins, and bake in 350 degrees F oven for approximately 12-18 minutes. Enjoy! This entry was posted in Breakfast, Muffins/Cupcakes, Quick Dishes, Vegetarian and tagged Banana Muffins, Quick Recipes, Vegetarian by thepantrydiva. Bookmark the permalink.